A 1931 Bugatti Type 51 Grand Prix Two-Seat Racer raced by Nuvolari and Taruffi for Lord Howe will be on sale at the 2016 Bonhams Quail Lodge auction. Francis Curzon, the 5th Earl Howe, entered the car four times in the Monaco Grand Prix, as well as in numerous other races in Europe including Brooklands, Donington, Nürburgring, Monza and Reims. The car had only two owners since the 1950s and has not been seen in public for two decades. The Bonhams Quail Lodge auction during the annual Monterey classic car week will be held on August 19, 2016, at the Quail Lodge in Carmel, California. At the Quail Lodge auction in 2014, Bonhams famously sold a 1962/3 Ferrari 250 GTO Berlinetta for $38,115,000 – the highest price ever paid for a car at public auction. The 1931 Bugatti Type 51 Grand Prix Two-Seat Racer, chassis 51121, estimate upon request, on offer at the 2016 Bonhams Quail Lodge auction has been in current ownership for over 30 years, has not been seen in public for over two decades. Purchased new by one of the most famous privateer racers in history, Francis Curzon, the 5th Earl Howe, first president of the British Racing Driver’s Club and long-term Bugatti client, it was one of the first Type 51s to be delivered and the first chassis number in a series of just 40 cars – 51121. Immediately set to task, number 51121 was campaigned in Great Britain and across Europe at race circuits including Brooklands, Donington, Nürburgring, Montlhéry, Monza and Reims, and at hill climbs including the Klausenrennen and Shelsley Walsh where it set fastest time of the day in 1932. Most notably, the 1931 Bugatti Type 51 was entered by Howe four times in the Monaco Grand Prix, placing 4th in 1932, and running to the late stages in the 1933 event, which many consider to be one of the greatest races of all time. Furthermore, the car was driven by arguably the greatest driver of all, Tazio Nuvolari, the Flying Mantuan, and fellow Italian Piero Taruffi at Brooklands in 1933. Campaigned in the national color of British racing green with Howe’s distinctive blue and silver stripes along the side of the bodywork, the GP racer was also visually notable by its large fuel filler caps fitted from its earliest days. 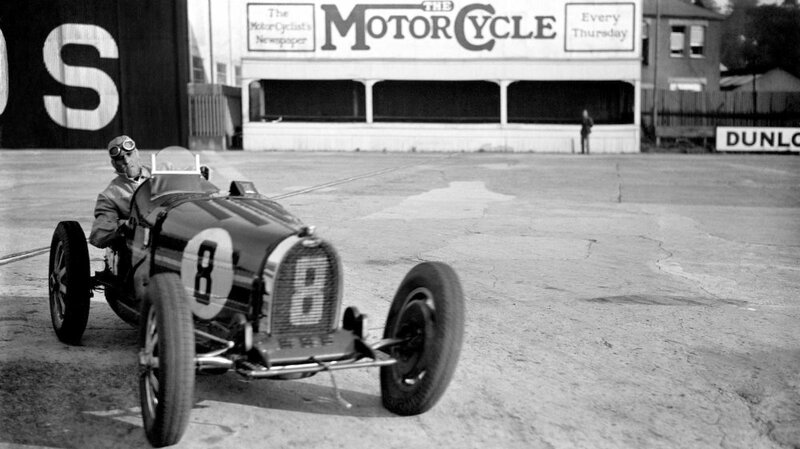 In addition to Nuvolari, Taruffi and Howe himself, the car was also piloted in period by The Hon. Brian Lewis and Clifton Penn-Hughes. The successor to the legendary Type 35, the Bugatti Type 51 is famous in its own right but also has a fascinating link to American engineering by way of the Miller racecars. Ettore Bugatti was so impressed by Harry Miller’s twin-cam engines that he traded three of his own Type 43 cars for two Miller 91 cars. Bringing them back to his factory in Molsheim, Bugatti had them dismantled, learned of their technology, and then built his own version. Thus the Type 51 was born. As ever with Bugatti, the aesthetics in every form compliment the incredible power of this American-inspired, Franco-Italian supercharged 2.3-liter twin-cam racecar. The result is a highly dynamic and potent sculpture of beauty capable of producing 160hp and a speed of 130mph. Never publicly offered for sale, in the present ownership for more than 30 years, unseen publicly for more than 20 years, and with just two owners since the 1950s, Bonhams considers this Bugatti as one of the finest examples in existence.